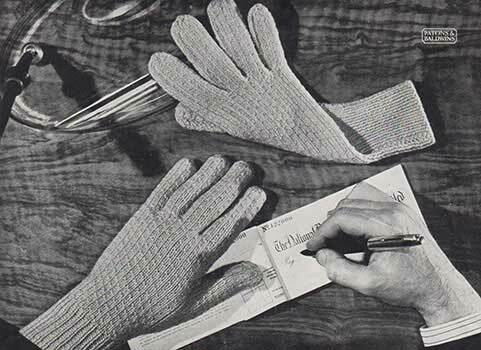 These gloves are knit flat and seamed. Patons Bluebell Crepe (to fit average hand) – 3 ozs. It is absolutely necessary to work at a tension to produce 8 stitches to the inch in width. 1st row: K2, * P1, K1, repeat from * to end of row. Repeat this row for 3 ins. 1st row: K2, (P1, K3) six times, (P1, K2) twice, P1, (K3, P1) four times, K1. 2nd row: K1, P16, K1, P5, K1, P25, K1. 3rd row: K1, (K3, P1) six times, K1, P1, K5, P1, K1, (P1, K3) four times. 4th row: Like 2nd row. Repeat 1st and 2nd rows once. 7th row: K1, (K3, P1) six times, K1, P1, increase once in next st, K2, increase once in next st, K1, P1, K1, (P1, K3) four times. 8th and 10th rows: K1, P16, K1, P7, K1, P25, K1. 9th row: K2, P1, (K3, P1) twelve times, K1. 11th row: K1, (K3, P1) six times, K1, P1, increase once in next st, P1, K3, increase once in next st, K1, P1, K1, (P1, K3) four times. 12th and 14th rows: K1, P16, K1, P9, K1, P25, K1. 13th row: K2, (P1, K3) six times, (P1, K4) twice, P1, (K3, P1) four times, K1. 15th row: K1, (K3, P1) six times, K1, P1, increase once in next st, K1, P1, K3, P1, increase once in next st, K1, P1, K1, (P1, K3) four times. 16th and 18th rows: K1, P16, K1 , P11, K1, P25, K1. 17th row: K2, (P1, K3) six times, P1, K1, (P1, K3) twice, P1, K1, P1, (K3, P1) four times, K1. 19th row: K1, (K3, P1) six times, K1, P1, increase once in next st, K2, P1, K3, P1, K1, increase once in next st, K1, P1, K1, (P1, K3) four times. 20th and 22nd rows: K1, P16, K1, P13, K1, P25, K1. 21st row: K2, (P1, K3) six times, P1, K2, P1, (K3, P1) twice, K2, P1, (K3, P1) four times, K1. 23rd row: K1, (K3, P1) six times, K1, P1, increase once in next st, (K3, P1) twice, K2, increase once in next st, K1, P1, K1, (P1, K3) four times. 24th and 26th rows: K1, P16, K1, P15, K1, P25, K1. 25th row: K2, P1, (K3, P1) fourteen times, K1. 27th row: K1, (K3, P1) six times, K1, P1, increase once in next st, (P1, K3) three times, increase once in next st purlways, K1, P1, K1, (P1, K3) four times. 28th and 30th rows: K1, P1 6, K1, P17, K1, P25, K1. 29th row: K2, (P1, K3) six times, P1, K1, (K3, P1) three times, K4, P1, (K3, P1) four times, K1. 31st row: K1, (K3, P1) six times, K1, P1, increase once in next st, K1, (P1, K3) three times, P1, increase once in next st, K1, P1, K1, (P1, K3) four times. 32nd and 34th rows: K1, P16, K1, P19, K1, P25, K1. 33rd row: K2, (P1, K3) six times, P1, K1, (P1, K3) four times, P1, K1, P1, (K3, P1) four times, K1. 35th row: K1, (K3, P1) six times, K1, P1, (K3, P1) four times, K3, P1, K1, (P1, K3) four times. 36th row: K1, P16, K1, P19, K1, P25, K1. In next row, K2, (P1, K3) six times, P1, K1, (P1, K3) four times, turn, K1, P16, turn, cast on 4 sts. Work 30 rows in pattern on these 21 sts. 1st row: K1, P1, K2tog, (K1, P2tog) twice, K1, K2tog, P1, K2tog, K1, P2tog, K2. 3rd row: (K1, P2tog) five times. Length of Thumb and Fingers may be varied to suit individual requirements. Break off wool, run end through remaining sts, draw up and fasten off securely. With right side of work facing, join in wool and knit up 5 sts from 4 cast on sts, at base of Thumb, K2, (P1, K3) four times, P1, K1, across 20 sts which were left. 2nd row: K1, (K3, P1) twelve times, K3. 3rd row: K1, purl to last st, K1. 4th row: K2, (P1, K3) twelve times, P1, K1. Repeat from 1st to 4th row three times, then 1st and 2nd rows once. In next row: K1, P6, slip these 7 sts. on to a stitch holder, purl to last st, K1. Slip last 7 sts on to a stitch-holder. Work 4 rows in pattern on remaining 38 sts. In next row: (K3, P1) six times, K3, turn, K1, P15, turn, cast on 3 sts. Work 32 rows in pattern on these 19 sts. 1st row: (K1, P2tog) twice, K1 , K2tog, P1, K2tog, (K1, P2tog) twice, K1. 3rd row: (K1, K2tog) four times, K1. Join in wool and knit up 4 sts from 3 cast on sts at base of First Finger, P1, K3, P1, K1, turn, K1, P15, turn, cast on 3 sts. Work 36 rows in pattern on these 19 sts. 1st row: K1, K2tog, P1, K2tog, (K1, P2tog) twice, K1, K2tog, P1, K2tog, K1. 3rd row: K1, K2tog, (P1, K2tog) three times, K1. Join in wool and knit up 4 sts from 3 cast on sts at base of Second Finger, K2, P1, K1, increase once in next st, turn, K1, P14, turn, cast on 4 sts. 1st row: (K1, P2tog) twice, K1, K2tog, P1, K2tog, (K1, P2tog) twice, K1. Join in wool and work in pattern across 7 sts from first stitch-holder, knit up 2 sts at base of Third Finger, work in pattern across 7 sts from second stitch-holder, turn, K1, P14, K1. Work 24 rows in pattern on these 16 sts. 1st row: K1, K2tog, (K1, P2tog) twice, K1, K2tog, P1, K2tog, K1. 3rd row: (K1, K2tog) three times, K2. 1st row: K1, (P1, K3) four times, P1, (K2, P1) twice, (K3, P1) six times, K2. 2nd row: K1, P25, K1 , P5, K1, P16, K1. 3rd row: (K3, P1) four times, K1 , P1, K5, P1, K1, (P1, K3) six times, K1. 7th row: (K3, P1) four times, K1, P1, increase once in next st, K2, increase once in next st, K1, P1, K1, (P1, K3) six times, K1. 8th and 10th rows: K1, P25, K1, P7, K1, P16, K1. 9th row: K1, (P1, K3) twelve times, P1, K2. 11th row: (K3, P1) four times, K1, P1, increase once in next st, P1, K3, increase once in next st, K1, P1, K1, (P1, K3) six times, K1. 12th and 14th rows: K1, P25, K1, P9, K1, P16, K1. 13th row: K1, (P1, K3) four times, (P1, K4) twice, P1, (K3, P1) six times, K2. 15th row: (K3, P1) four times, K1, P1, increase once in next st, K1, P1, K3, P1, increase once in next st, K1, P1, K1, (P1, K3) six times, K1. 16th and 18th rows: K1, P25, K1, P11, K1, P16, K1. 17th row: K1, (P1, K3) four times, P1, K1, P1, (K3, P1) twice, K1, P1, (K3, P1) six times, K2 . 19th row: (K3, P1) four times, K1, P1, increase once in next st, K2, P1, K3, P1, K1, increase once in next st, K1, P1, K1, (P1, K3) six times, K1. 20th and 22nd rows: K1, P25, K1, P13, K1, P16, K1. 21st row: K1, (P1, K3) four times, P1, K2, (P1, K3) twice, P1, K2, P1, (K3, P1) six times, K2. 23rd row: (K3, P1) four times, K1, P1, increase once in next st, (K3, P1) twice, K2, increase once in next st, K1, P1, K1, (P1, K3) six times, K1. 25th row: K1, (P1, K3) fourteen times, P1, K2. 29th row: K1, (P1, K3) five times, K1, (P1, K3) three times, K1, P1, (K3, P1) six times, K2. 31st row: (K3, P1) four times, K1, P1, increase once in next st, K1, (P1, K3) three times, P1, increase once in next st, K1, P1, K1, (P1, K3) six times, K1. 32nd and 34th rows: K1, P25, K1, Pl9, K1, P16, K1. 33rd row: K1 (P1, K3) four times, P1, K1, P1, (K3, P1) four times, K1, P1, (K3, P1) six times, K2. 35th row: (K3, P1) four times, K1, P1, (K3, P1) five times, K1, (P1, K3) six times, K1. 36th row: K1, P25, K1, P19, K1, P16, K1. In next row: K1, (P1, K3) four times, P1, K1, P1, (K3, P1) four times, K1, turn, cast on 4 sts, K1, P19, K1, turn. 3rd row: (P2tog, K1) five times. Finish off as given for Thumb of Right Glove. With right side of work facing, join in wool and knit up 5 sts from 4 cast on sts at base of Thumb, (P1, K3) six times, P1, K2, across 27 sts which were left. 2nd row: (K3, P1) twelve times, K4. 4th row: K1, (P1, K3) twelve times, P1, K2. Repeat from 1st to 4th row three times, then 1st and 2nd row once. In next row: K1, P6, slip these 7 sts on to a stitch holder, purl to last st, K1. Break off wool, slip last 7 sts onto a stitch holder. In next row: K2, P1, (K3, P1) six times, turn, cast on 3 sts, K1, P17, K1, turn. Work on these 19 sts as given for First Finger of Right Glove. Join in wool and knit up 4 sts from 3 cast on sts at base of First Finger, K3, P1, K2, turn, cast on 3 sts, K1, P17, K1, turn. Work on these 19 sts as given for Second Finger of Right Glove. Join in wool and knit up 4 sts from 3 cast on sts at base of Second Finger, K1, P1, K3, turn, cast on 4 sts, K1, P16, increase once in last st, turn . Work on these 19 sts as given for Third Finger of Right Glove. Join in wool and work in pattern across 7 sts from first stitch holder, knit up 2 sts at base of Third Finger, work in pattern across 7 sts from second stitch holder, turn, K1, P14, K1. 1st row: K1, K2tog, P1, K2tog, (K1, P2tog) twice, K1, K2tog, K1. 3rd row: K1, (K1, K2tog) three times, K1. Sew up Thumb, Finger, and side seams. Finally, press all seams. The original publication of this pattern is in the public domain, however this digital version with updated language is copyright Sarah Bradberry, July 14th 2012. All rights reserved.